After lagging the rally in crude oil itself at various points in 2019, energy stocks seemed to be waiting on more bullish assurances before engaging in a broad-based move. And we may have just that this morning, as the Chevron deal for Anadarko (APC) may be kicking off a new wave of M&A in the oil patch (with OXY in the mix as another bidder to spice things up). It remains to be seen if the entire energy sector can gather momentum based off the APC deal. 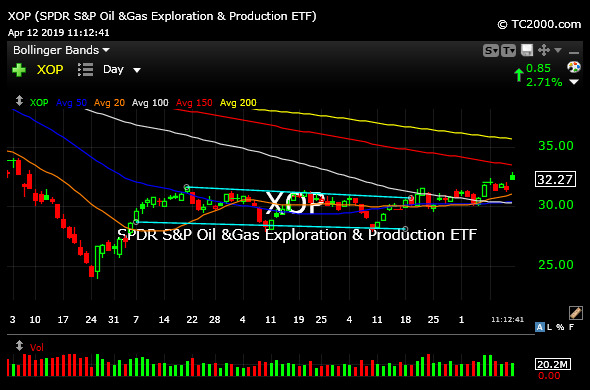 However, the XOP, ETF for exploration firms, seen on its updated daily chart, below, is at least making some progress moving up towards its declining 200-day moving average after a base bottom in recent months. As you can see, there is more work ahead for energy bulls, M&A or not. But one must start somewhere, and energy stocks are at least headed in the right direction. We have a few plays in mind with Members and are testing the waters this morning. Elsewhere, the move in GoDaddy (GDDY) yesterday caught plenty of buzz from traders, but I still think WIX is the best overall chart and business model with growth in comparable segments of tech.